Please read the above linked-to articles in detail. If you provide each of these three things in the proper way, you will have a healthy, happy Venus Fly Trap as you see below in the photo. 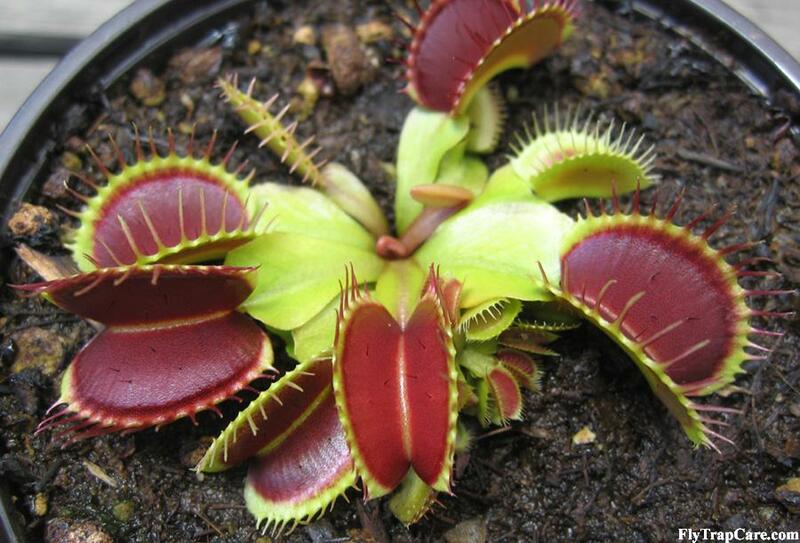 Below the photo is a brief summary of the care needs of a Venus fly trap. Give Venus fly traps as much light as you can. Full direct sunlight at least four hours a day is best, though Venus fly traps can flourish under strong artificial lighting as well. Water them with “pure” water (low in mineral content), either distilled, rainwater, or other water that has a low concentration of dissolved solids. For optimal growth, do not keep Venus fly traps sitting in water. They prefer to have their soil always damp, never dry, and not too wet for too long. And plant Venus flytraps in a proper mix of nutrient-poor medium. Most people use peat, sphagnum moss, sand and perlite in some combination. Long fiber sphagnum moss works well for Venus fly trap soil too. If possible, keep the ambient humidity high, though this is not critical. Venus Fly Traps can thrive in low humidity. Just be sure to keep their soil damp at all times when the humidity is low. If you are growing your plant in less than ideal conditions, or you just want the biggest traps possible, it’s best to not let them flower. Try to cut the flower stalk off as soon as you notice it. Flowering robs the plant of precious energy that it could otherwise use to make itself larger or produce better leaves and traps. Also, as a flytrap grows, it will often form little offshoots with a second rosette or multiple rosettes of leaves. These offshoots will eventually form their own root systems. When you go to repot your venus fly trap you can gently pry the rosettes apart and have separate Venus fly traps. If you cut the flower off, the Venus flytrap will be more likely to divide and form separate rosettes through the growing season due to the fact it can put more energy into growing.